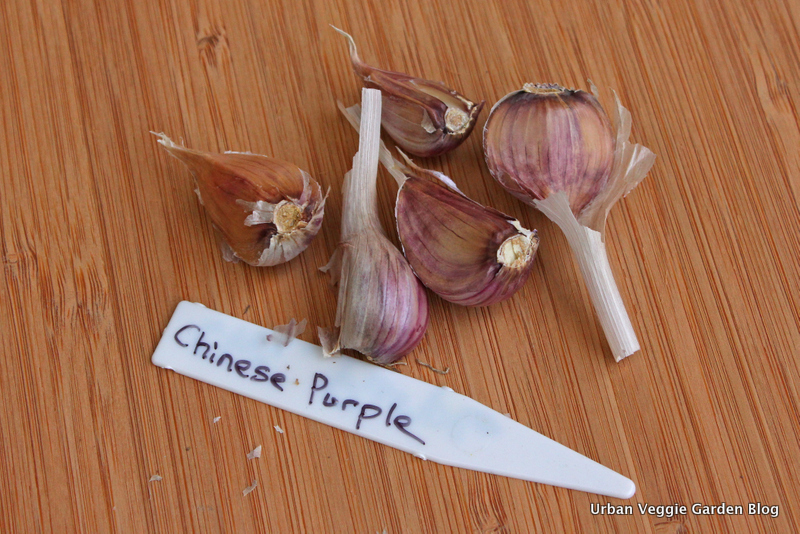 Fall has arrived so it is garlic time again. This year I am planting at the proper time as appose to last year when I planted in late December, tis tis. I decided to finally give in and order some interesting varieties. It can be kind of expensive to order garlic so normally I would just replanted from the current years crop. The bed was cleared, turned and amended with my black gold. Then to speed things along I just jabbed in a trowel and stuck the clove in the hole. I am too lazy to dig a trench this year! I put in 6 varieties this year which I will show below. 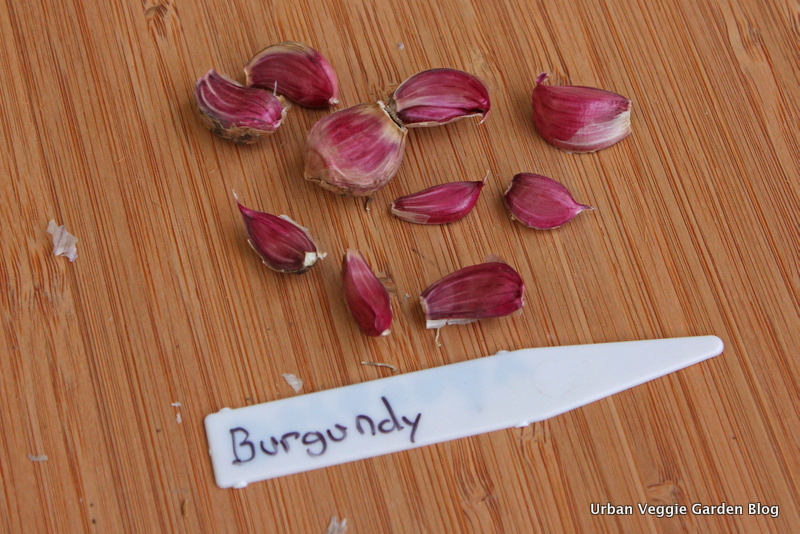 Then the remaining area was planted with my standby variety that has monster sized cloves. To my surprise Wildfire looks like it might be the best of the bunch. It has two huge cloves per head and is suppose to be really hot. Can't wait for next summer when I can give them a try. If you're interested all the garlic came from Boundary Garlic Farm which has a great selection of organic garlic. I believe they only ship within Canada and you have to order in August, they sell out quickly. Here goes another Harvest Monday post. Below is a collection of harvests since my last post. The garden is still chugging along and I am happy to have beans coming in again. It has still been really dry, the only good news is the temperature has cooled a bit. Breakfast, Pink Berkley Tie Dye and Better Boy. Kellogg's Breakfast Tomatoes. They have been a real performer this year! Purple Podded & Blue Lake Pole Beans. Slicing Cucumbers and Better Boy Tomatoes. and in my opinion the best tasting bean. In other news I started a bunch of fall crops in pots a while ago and they are just about ready to plant in the garden. The polytunnel has also been all cleaned up and it is ready to go in the garden. I'll be planted everything this week so I'll get a post up about the fall stuff later this week. and a bunch of Better Boy tomatoes. Also today, a bunch of slicing cucumbers & Sungold cherries. Slicing cucumbers, Sungold cherries & Better Boy tomato. went in the compost because the heat made them taste awful. zucchini because the plant shriveled up and died shortly after. These two were the first full sized tomatoes of the season on July 16th. They are Better Boy tomatoes and they turned out to be really good. I picked the plant up on a whim at the nursery and I am glade I did. On another note, is it just me or is this new post creator really buggy and annoying? The photos seem to not like to move and it is close to impossible to place text below photos. Any trick for getting around this? Today I harvested all the garlic. 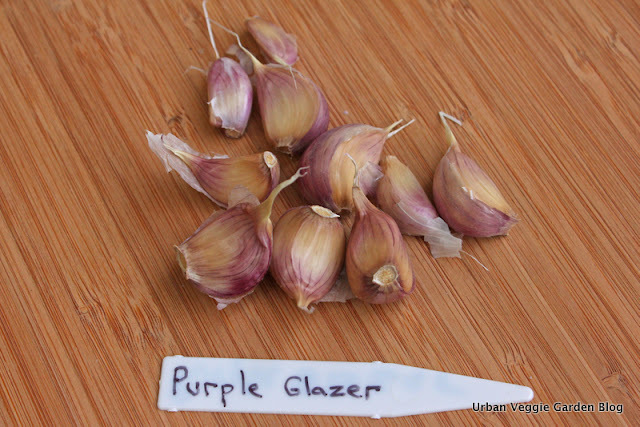 It seems kind of early to harvest garlic put it was definitely ready. It is a little small this year, likely due to my December planting. Amongst the garlic I had a bunch of potatoes come up from last years garden. I swear I got them all last fall :) I'm not complaining though because these mini potatoes will be excellent for dinner tomorrow. Odds and sods are the first tomatoes of the season, sungold cherries. Along with a few broccoli side shoots and a mini zucchini. These will be added to a salad tomorrow. Lastly here is a couple heads of broccoli I harvested last week. The broccoli has been great this year. The only issue I have had is I lost a few heads last week to the heat. Last Tuesday I harvested the first broccoli of the season. Fresh broccoli can not be beat! It was quickly blanched and served with slow roast duck and potatoes roasted in duck fat. All was cooked on the grill as it has been close to 40c(104f) for most of the week. The garden is doing quite well this season. The only thing needed at the moment is to pull some bolted lettuce and replant the area. I also have a bit of weeding to do. Once that is completed I will post an overdue overview of the garden. The last section of fencing was completed a few weeks ago and last weekend I completed the new retaining wall. Previous to the fence I had a garden tie retaining wall close to the tree and it had rotted out over the years. So I pulled that out and replaced it will a dry stone wall. All the stones were collected in the country (free!) and then I filled the area with triple mix hauled in by our truck. Once it cools down this weekend I will be dividing plants to fill the bed. One bed down, All the rest to go! May 3rd I planted the first bed of the season consisting of Broccoli and Pea's on the trellis behind. I also put in a few lettuce starts. The broccoli is doing well but it has not been the best season for peas. Hopefully they will catch up soon, it has been really dry this spring. This weekend is the typical planting time for none hardy crops in the area. The plan is to get everything in, we'll see how I do. Lots of pictures to follow when I am done. I am looking forward to home grown veg again! 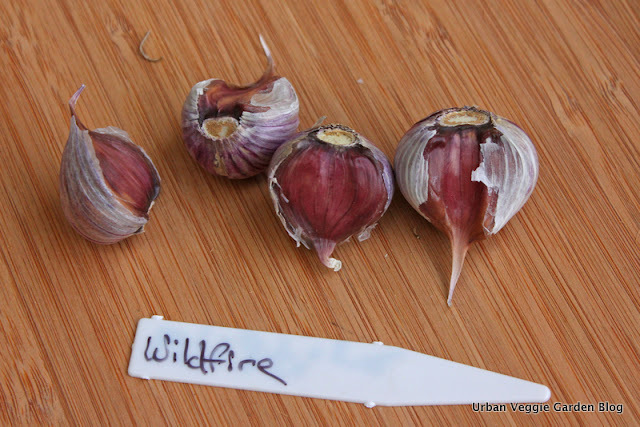 Back on Dec 13th I planting my garlic, a bit late but the winter has been very mild. This year I am going for a less fussy garden so I just planted out a whole bed of the stuff. 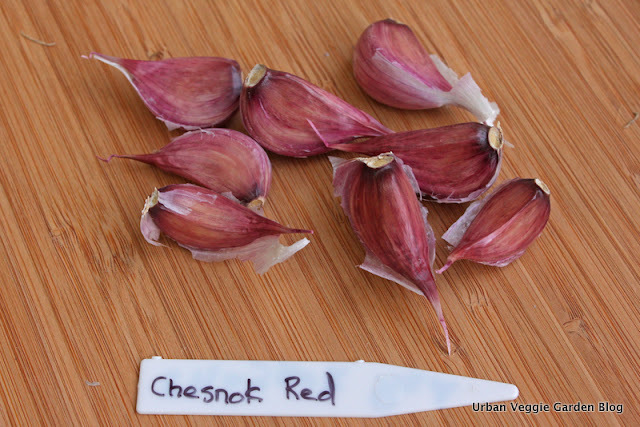 The bed is mainly planted with a large cloved hard neck variety, the farmer it came from calls it Elephant garlic. 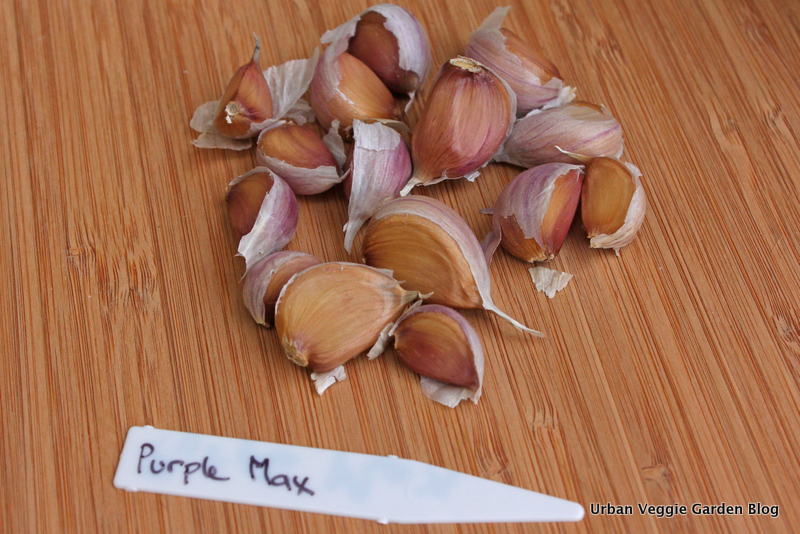 I also put in a few soft neck cloves that have a purple skin. The garlic is now just starting to pop up. A good sign spring is coming! The last couple days have been so nice which has got me in the mood to plant. Today I started a few cells of hardy greens including mixed lettuce, kale, winter density lettuce, red pac choi, tatsoi and bright lights chard. They are now on a heat mat and at the first signs of life they will go out in the coldframe. Soon things will start ramping up in the garden so I will actually have something to post about. First things on the to-do list is getting my grow light set up and completing a garden plan. Once mid March rolls around I will be starting all the tomatoes, peppers, brassica's and peas. Here's hoping this season is better then last! To wrap this up, the snowdrops made an appearance a couple weeks ago. It sure will be nice when it is green outside again!